SOCIAL entrepreneurs have turned the crippling power grid problems into an opportunity to offer electricity at low cost and by using local resources to light the lives of rural masses groping in darkness. Where traditional non-renewable energy sources of coal, natural gas and firewood are depleting fast and environment concerns are mounting; use of clean eco-friendly technology to generate electricity from biomass, hydro and solar energy as small-scale enterprises is commendable. Rural youths are employed to operate them and more and more jobs are created. The vast pine forests in Uttarakhand provide great scenic beauty. But the pine needles shed during summer catch fire easily, leaving behind a trail of destruction due to forest fires. Rajnish Jain harnessed the energy trapped in these pine needles and used it to produce electricity. The technology used is biomass gasification, when pine needles burn to produce energy that drives an alternator that generates electricity. Based in Berinag village in Pithoragarh district, Jain was working for rural development through his organisation ‘Avani’ and set up the first power plant that produced 9KW of electricity. Recently, they test ran their 120 KW power plant in Chachret village (Pithoragarh district). “Though we are going to feed the power in the grid, this power plant will generate enough power for 1200 rural families, apart from meeting the cooking need of 100 families,” said Rajnish. Three more such power plants will be set up next year. The electricity in these villages improved the local economy. As villagers earned by collecting pine needles, forest fires were reduced. Youth got employment. The byproduct of gasification, charcoal, could be used as clean fuel thus cutting of firewood was reduced. The collection of pine needles from 1-2 hectares of forest provides electricity to 50 people and charcoal for cooking to five people. Rice is the staple food for the people of Bihar but its husk, a waste product of rice milling is of no use. Gyanesh Pandey, an IT BHU alumnus, saw the potential to use rice husk as a fuel in micro power plants to produce electricity where there is no power grid. The technology in use is biomass gasification that produces gas that runs generators to produce electricity. Through his NGO, Samta Samriddhi Foundation, Gyanesh set up the first power plant at Tamkuha in West Champaran district in 2007. Next year he started the company, Husk Power Systems (HPS, to meet energy needs of rural households through a micro-grid system by providing cheap, sustainable and eco-friendly electricity. Even the jacketed wires are hung on bamboo poles that transmit power directly to consumers. Currently they have 90 mini-power plants functional in Bihar. HPS has lighted 400 villages and directly employs 375 local people. It has also sponsored 250 children in private schools. There is Husk Power University to train rural workforce for jobs. With electricity the village economy has improved considerably and they have also franchised the mini power plants to 10 franchisee owners to be run as small business. The Ramon Magsaysay awardee Harish Hande, an IIT Kharagpur alumnus, started SELCO (Solar Electric Light Company), in 1995 in Karnataka to provide electricity to rural households and even urban slums that are off the power grid. As a PhD student at the University of Massachusetts, he worked on his thesis on rural energy service delivery from solar-tracking technology. He found the usefulness of solar technology to light houses and power irrigation pumps, thus conserving fossil fuels and reducing carbon footprints in villages. The technology uses a basic set-up of 4-7 watt CFLs, a photovoltaic cell mounted on the roofs of rural houses and a lead acid battery that stores electric power generated by the PV cell. This enables bulbs to provide light during night too. Today SELCO lights 150,000 households and enterprises in Karnataka, Kerala, Tamil Nadu, Gujarat, Maharashtra and Bihar. Through the social initiative, solar- powered study lights are given to students that have detachable batteries that could be charged in schools. It has impacted 15,000 economically deprived students within a year, improving their school attendance too. Street vendors use solar lights on rent, thus augmenting their income. SELCO has impacted household income directly and indirectly through job creation and training skill force. Through the non-profit SELCO Foundation they develop, finance and test new technologies. Yogeshwar Kumar, an IIT Delhi alumnus, harnesses electricity through micro-hydroelectric plants in villages not connected to the power grid. First set-up in 1975 on a stream in Uttarakhand to light up incubators in a lab, he eventually built 15 such power stations (15-40 KW) in the hilly regions of Uttarakhand (also Kargil, Ladakh, Meghalaya and Orissa) that are manned and operated by the locals themselves. He laments that 82 per cent electricity is generated from coal and thermal (diesel, gas) sources, while only 18 per cent is from renewable sources. Then 75 per cent of the country’s population residing in villages uses just 30 percent of total electricity. Yogeshwar, through his NGO Jansamarth, uses electricity as a base to create a cottage industries hub so that local resources are fully utilised and the village economy grows. Villagers use the power to run atta chakki, oil mills, welding workshops, saw mill and others. When women switch to electricity for cooking thus reducing chopping of firewood further saving the forest. Currently, Yogeshwar is working on traditional water run grinding mills that have a capacity of 1-5 KW of power that are used for grinding flour. “They can be modernised and made efficient for milling and other productive operations and electricity generation,” says Yogeshwar. 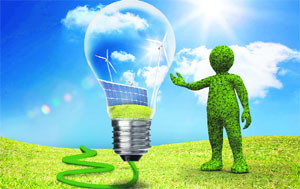 The energy that is produced by natural sources that is clean and green is called renewable energy. Natural sources like the sun (solar energy) and wind are limitless. Other energy sources are water (hydel power), biomass (that includes agricultural residues, animal dung, biodegradable waste from cities and crop residues), geothermal energy (hot dry rocks, natural geysers, hot springs) and ocean thermal energy (waves and tidal waves). With global warming becoming a major environmental issue, people are waking up to the harmful effects of non-renewable sources that is fossil fuels such as coal, crude oil and natural gas. Electricity generated from fossil fuels produces high concentration of harmful gases. New technologies help to produce energy from renewable sources that are clean and affordable. Electricity generated from through solar panels, wind turbines, micro-hydroelectric power stations and biomass gassifiers emits little or no carbon. Pine needles that litter Uttarakhand forests can be used to produce energy. Similarly, rice husk that is agricultural waste in states where rice is the staple food caqn light up villages. Micro-hydroelectric projects can be set up in inaccessible mountain areas and have low environmental impact, and prove a boon to villages. The electricity produced by these social entrepreneurs through renewable resources not only lights dark villages but transforms those rural areas. In our country where a large rural area is off the state electricity power grid, life in those villages ceases to exist after dark. Electricity generated by these entrepreneurs impacts rural lives socially, economically and environmentally. Rural people get clean energy at affordable prices. Small business enterprises can remain open beyond dusk, thus boosting income and improving village economy. Students can study after dark. Indoor air-pollution due to kerosene lamps and diesel generators is considerably reduced, hence health improves. Byproduct of biomass plants can be used for other purposes, thus benefitting rural people and reducing carbon footprints are greatly reduced.